History of Drones : All You Need To Know About it ! Home» Tips & Tricks » History of Drones : All You Need To Know About it ! When the word DRONE hit a normal person mind it suddenly clicks to something like a WEAPON up to some extent it is true that a DRONE can be a Weapon but in this 21st century the drone is not a weapon but it is a toy too and you can now even buy drones at a cheap price. Did you think ever that from were this unmanned or you can say non-pilot technology comes from and how old it is? Would you believe if I say that the first unmanned aerial vehicle was created almost 170 years ago? Yes, you read it right it's 170 years old technology, in other words, you can say that it is the technology from the previous century (It sounds crazy). First, for those who don’t know, it’s necessary to learn that the word “drone” simply refers to an "aerial vehicle" that is unmanned. Unmanned means that the pilot does not sit or stand inside the vehicle itself. Well, it is true that the first drones were seen in 1839 when Austrian militants bombed the city of Venice with unmanned balloons loaded with explosives. Some of those Austrian Balloons were successful to hit the enemy, but most of them failed back and blasted the Austrians’ own lines, so the method did not become widely used due to this first failure. The discovery of flying aircraft changed everything for manned and unmanned vehicles. UAV technology enhanced completely after World War II (which saw a number of technological improvements as we all know) and into the Cold War as well. But these are so big in size t see and are very expensive in the price as well. New discoveries in manned aircraft like the Flying Fortress and the SR-71 Blackbird. Both the US and the USSR used unmanned drones to some extent to spy on each other during the War, but the specifics are still divided and the leaked reports are often inconsistent. The modern drone battle started in the earnest in 1982, when Israel organized the use of battlefield UAVs beside manned aircraft to clean the Syrian fleet with very minimal losses. The Israeli Air Force used military drones to recon the enemy’s location, to block transmissions, and to act as decoys that would prevent the loss of pilot life. The technology was nothing different, but the IAF(Indian Air Force) decided out how to use drone technology in a way that would make operations more successful from the past. The United States spent tens of millions of dollars on new drone contracts in 1984. According to a report, the history of non-military drone use began in the earnest in 2006. The drones are used for disaster relief, border surveillance and wildfire fighting, while big organizations started using drones to inspect pipelines and spray pesticides on farms. As unmanned aerial vehicle technology enhanced in the military sector, those same technological advances could be used in the private sector. You may be astonished to hear that recreational drone use actually only took off very recently, and it’s grown fast. 2006 was the first year that the FAA circulated a commercial drone license. They issued a tally of two of these licenses a year for the next eight years – that was all that was demanded. Then, in 2013, Amazon CEO Jeff Bezos proclaimed that the company was considering applying drones as a delivery method. In 2015, the FAA ( Federal Aviation Administration ) issued 1000 drone licenses, a figure which more than tripled to 3100 licenses in 2016 and which has maintained to grow in the time since. What is the Future of Drones ? Well, the technology is developing day by day which leads to a brighter future for the drones. Numbers of different companies are working for the betterment of the drones and making it easier and better than ever. Even the drones taxis are introduced which needs no driver for it and after that, in Future, you can see much more advancement in the field of drones. The journey from the balloons filled with explosives to the flying taxis in the air. I have really enjoyed writing this article and hope that all of you also liked the interesting history of the drones. 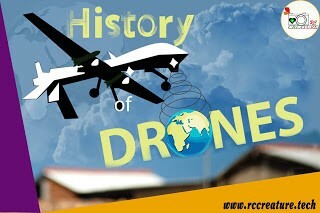 Let us know in the comment section if you like the history of drones.